Nautilus is a major name when it comes to manufacturing high-grade and reliable exercise machinery. While they have only two recumbent bikes in their arsenal of machines, the R614 and R616, both of them are extremely great gym level bikes that can spice up your workouts at home. 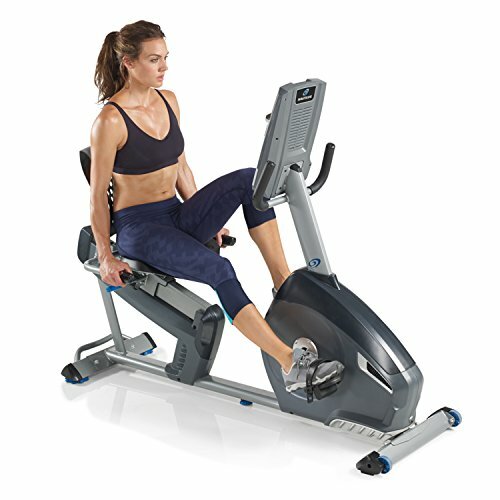 Delicately designed, with a multi=purpose console that is packed with so many exciting features, and an admirable price to quality ratio, the Nautilus R614 is one of the best recumbent bikes you can find in the market for its price which is guaranteed to serve your needs well over a long period of time. The Nautilus R614 consists of a one piece frame that is of solid steel construction. The design of it is made to improve upon stability while also keeping the bike sturdy enough for rigorous use. At the front base of the bike are transport wheels that will make it easier to transport the bike from one place to another. At the back of the bike are levelers and a handle that will make it easy to lift up the bike and balance it on the front wheels as you transport it. The R614 is itself designed to accommodate maximum user weights of up to 300 pounds, making it durable for people of different weight and body types. The bike is specifically designed to enhance comfort and ensure for maximum workouts with the least amount of stress on ankles, joints and muscles. The handlebars on the front and of the seat are padded with foam and are ergonomically designed for you to comfortably latch on to as you pedal. The handlebars themselves feature heart rate sensors that transmit data of your pulse to the console. The seat itself is made of hard plastic but is designed in such a way that it provides comfort and makes way for a healthy posture. The bike’s seat features an adjusting rail system that allows you to adjust it horizontally in order to make space for adequate leg room whenever you’re working out. According to customer reviews, the bike can comfortably accommodate users of heights up to 6”4’. The Nautilus R614 features a drive system that has a pulley bigger in diameter than a flywheel. The R614 is also equipped with a high-inertia, perimeter weighted flywheel, which make the pedaling experience feel a lot smoother, steadier, and more easy thus reducing the impact on your joints. This recumbent exercise bike is sturdy, durable and very stable due to the large footprint it features. The perimeter weighted flywheel also keeps this bike grounded and provides a smooth and realistic motion. As for the brake system, the Nautilus R614 recumbent bike is powered by eddy current brakes for which you will have to make sure the bike is first connected to a power source, from where you can then adjust levels of resistance as per your liking. 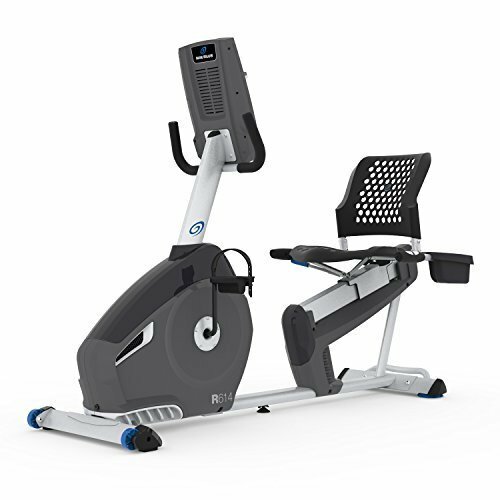 The console part is where the Nautilus R614 Recumbent bike truly thrives as it offers a wide variety of features. 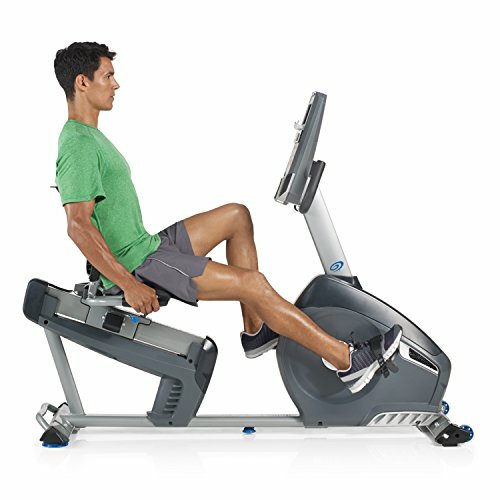 When it comes to progress optimizing and tracking, the computer of the Nautilus R614 is quite versatile as it offers 22 preset workout programs which can provide different levels of resistances as you pedal for different levels of intensity, depending entirely on your preferences. The preset workouts include 9 profile programs, 8 for heart rate, 2 fitness programs, 2 custom, and 1 quick start program. The readings on the DualTrack LCD screens display vital numbers such as distance covered, total speed, amount of calories burned, RPM, and heart rate. On the console you will find it possible to choose between 20 of the total available resistance levels. Also featured are ten keys for quick adjustment of resistance, helping you automatically change them on the fly. The Nautilus R614 also has a console unit capable of supporting two user profiles, with different program settings which is pretty useful if two people are using the same machine as it will help each of you keep track of their own readings and goals. A USB port on the console makes it possible for you to export your workout data and upload it to MyFitnessPal and Nautilus Connect in order to analyze and keep track of your workout progress. The apps will help you give dietary and other workout suggestions in line with your progress. A 3 way fan prevents the bike from heating up and is also very useful when you’re pedaling intensely as it will keep the bike cool and avoid issues of overheating. To add icing to the cake, the Nautilus R614 also has two crystal-clear, crisp sounding, acoustic speakers on the bike’s console that supports both iPhone and MP3 player inputs, making it possible for you to enjoy music as you work out. The joys of having machine that supports music can never be downplayed and is personally one of my favourite features in any exercise machine. Other benefits include a tablet holder for you to place your tablet in and multitask as you pedal, thus ensuring you can work, watch films, or commit to other tasks while also toning your body. So with most of the essentials having been covered, let us weigh the pros and cons of this machine. The Nautilus R614 is a great piece of machinery to own at your home. This is a gym quality recumbent bike which serves as an excellent exercising machine for toning your lower body muscles and keeping you in the right cardiovascular shape. The bike is sturdy, comfortable, and well designed to make things easier for almost every kind of user. Rest assured that getting this bike for your home will be a very reliable investment for the long run. With a top-notch gym level recumbent bike such as this at your home, your lower body workouts will reach new levels of unprecedented effectiveness than ever before.